"Winged Bridge" cufflinks, circa 1930. A wise philosopher once suggested that "True wisdom is knowing what you don't know." In this spirit, this month's note takes a look at three cufflink makers from the early 1900s about whom we know very little. It is conservatively estimated that between 1870 and 1930 at least several hundred companies in the United States were involved in the creation of fine jewelry. No doubt, a good share of these firms offered cufflinks at one time or another. About some of these cufflink makers we know quite a bit (e.g., Krementz & Co. and Larter & Sons). But about others we know very little beyond the beautiful cufflinks and jewels they created. This note highlights three of these mysterious makers. Wm. Huger & Company gold cufflinks, circa 1920. Based on extant examples, William Huger & Company appears to have made striking cufflinks from the early 1900s until the 1930s. A patent issued in 1883 for a specialized jeweler's file indicates that William Huger was involved in the jewelry trade from at least the early 1880s. Beyond this our knowledge of the firm is limited to several listings in jewelry directories and trade journals. William Huger Art Deco cufflinks, circa 1930. William Huger was not as prolific as some of the fine cufflink makers of the early 20th century (e.g., Carrington & Company and Wordley, Allsopp & Bliss). However what the firm lacked in size and numbers, it made up for with the beauty of its cufflinks. Among my favorite William Huger cufflinks are examples from the Art Deco era. The firm created bold geometrically-inspired cufflinks that are emblematic of the period. Two examples are illustrated here. 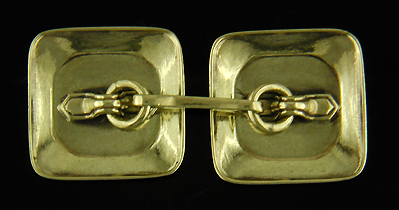 Architecturally-inspired William Huger cufflinks, circa 1930. The paucity of information we have regarding William Huger & Co. is a veritable trove compared to what we know about the next cufflink maker. Elegant "Winged Bridge" maker cufflinks, circa 1920. During the 1920s an unknown jewelry maker created a desirable group of white and yellow gold cufflinks. The cufflinks feature dramatic Art Deco geometric and stylized borders crafted in white gold. The centers are usually yellow gold and beautifully engine turned with intricate designs. These miniature jewels sparkle with the exuberance of the Jazz Age. The unknown maker of these cufflinks employed a distinctive bridge design. The bridges flair out like the wings of a fantastic bird. Hence the name "Winged Bridge Maker". "Winged Bridge" maker, circa 1925. Other than the winged bridges, there is no maker's mark or other indication of the creator of these cufflinks. The absence of a maker's mark is especially puzzling given the "14K" gold purity mark stamped on the bridges. In 1906, the National Stamping Act required that items stamped with a gold or silver purity mark should include a registered maker's mark. The mystery of the Winged Bridge cufflinks deepens. 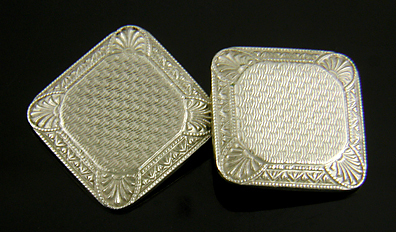 "TH" maker cufflinks with anthemion corners, circa 1925. The third group of mystery cufflinks has a maker's mark, a "T" over an "H". The challenge is identifying the maker to whom this mark belongs. The cufflinks are crafted in the Art Deco style, ranging from the classically-inspired pair with anthemion corners pictured above to the black enamel and pinstripe ovals shown below. The cufflinks are crafted in 14kt white and yellow gold and date from the 1920s and 1930s. Some may also be from a later date. Enamel and pinstripe "TH" cufflinks, circa 1925.
on the cross bars above the gold purity mark ("14"). Distinctive brackets of "TH" cufflinks. A second identifying characteristic of "TH" cufflinks are the distinctive brackets. Shaped somewhat like a bow tie, the brackets have an inner edge that is outlined with an incised channel. When the maker's mark is obscured, the distinctive brackets can aid in identification. "TH" maker cufflinks, circa 1930. Maybe the "TH" cufflinks are less of a mystery than I have suggested. I have a nagging suspicion that the maker of these cufflinks is already known and that to date I have been looking for answers in the wrong place. Any light you can shed on this and the other questions posed by this note is greatly appreciated. Recent additions to the Antique Cufflink Gallery include a striking pair of Art Deco cufflinks featuring green tourmalines, elegant Carrington sapphire and diamond cufflinks, and two pairs of oval gold cufflinks with pinstripe centers. Art Deco Green! Among the finest Art Deco cufflinks are those that combine bold, dramatic design with striking colored gemstones. These 14kt gold cufflinks set with intoxicating green Tourmalines are a wonderful example. Crafted by Larter & Sons, circa 1930. Carrington Sapphire and Diamonds! Sapphires, diamonds and platinum sparkle in these lively cufflinks. Surrounded by elegant twist borders with millegrain edges. Crafted in platinum and 14kt gold, circa 1920. Scrolls and Pinstripes! Exuberant Art Deco cufflinks with lively scroll borders and elegant pinstripe centers. Crafted in 14kt gold, circa 1925. Golden Pinstripes! Elegant gold cufflinks with pinstripe centers surrounded by classic double-box-and-cross borders. Crafted in 14kt gold, circa 1930.